"Vrindavana is a transcendental beautiful place. It is in the spiritual sky, where everything is made of touchstone, which fulfills all desires. All the temples there are bedecked with costly jewels. In that far distant place is the River Yamuna, which is full of lotus flowers. In the midst of that throng of lotus lowers there is a golden boat, appearing like another big lotus flower, with eight petals, who are none but the chief gopis who always surround Radha and Krsna. In the surrounding petals there is a golden throne where the two transcendental lovers, namely Radha and Krsna, are seated, but of all of them the governing Deity is Srimati Radharani. There is no comparison to Radharani's beauty and the luster of Her transcendental body. The so-called beauty of the moon has fallen on the ground in the presence of Radharani's beauty. In that assembly of Radha-Krsna and Their principal associates there is a flood of laughing and joking as they address one another. 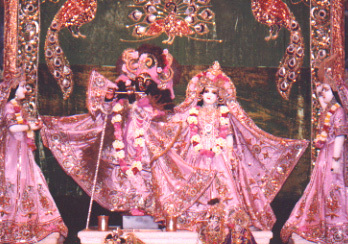 Narottama das says that the eternal pastimes of Radha-Krsna from day to day are full of transcendental pleasure. Let us all remember them now and then and thus become happy even in this material world."